Internet TV network Revision3 is today formally debuting a new TV-optimized website and bringing its full catalog of online content to multiple platforms including Google TV, Yahoo! Connected TV, Windows Media Center, AppleTV, Boxee and Roku. Revision3, which was founded by Kevin Rose, Jay Adelson and David Prager, is porting its full line-up of more than 20 programs to the television screen, including shows like Tekzilla, Diggnation, AppJudgment, Dan 3.0 and Film Riot. 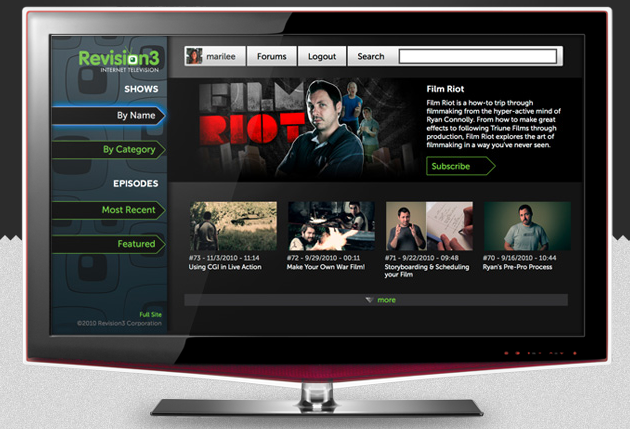 You can use either customized applications for the various Internet-enabled television sets or combos, or you can simply visit TV.revision3.com to watch the shows. The application’s user interface was designed to make finding content simple, according to the company, as it sorts shows by name, category, featured content and most recent episodes. Viewers are also able to manually search for their favorite episodes and “lean back and watch” fresh content. Will you be tuning in to the no-longer-strictly-Web-only Internet TV network from your TV?